The Heritage Museum of Orange County is giving free admission to Santa Ana residents this upcoming weekend on Sunday, January 3 from 11 am-3 pm. Their programming offers school children the opportunity to partake in innovative hands-on programs designed to encourage exploratory and imaginative learning. Dedicated to enhancing education, the museum has helped preserve, promote and restore the heritage of Orange County and the surrounding regions since 1985. Over the past decade, the museum has sustained itself by developing a fee-based social service enterprise, and by offering a variety of other activities including public tours, tea parties, themed fundraisers, weddings and corporate events. Click here for a map and directions to the Heritage Museum. 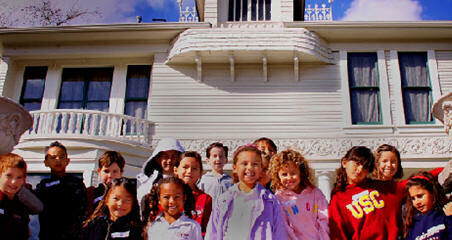 The Heritage Museum is located at: 3101 West Harvard Street, in Santa Ana. Public Hours Tours and Event Guests. Park in the Mitchell Elementary School lot just east of the museum grounds. Park in one of the spaces designated for the museum and enter the grounds through the formal gate in front of the Kellogg House. Representatives from the Census Bureau will also have a booth there to display information, provide job opportunities, and answer any questions that the public has about the upcoming questionnaire. For more information about the 2010 Census, click here. « Is Mike Metzler on the way out of the Santa Ana Greater Business Alliance?